Gap down opening of 40 to 60 Nifty points or 0.8 % is expected with possibility of choppy session and gap filling at later stage .Last week closed at negative note post positive move of three weeks . 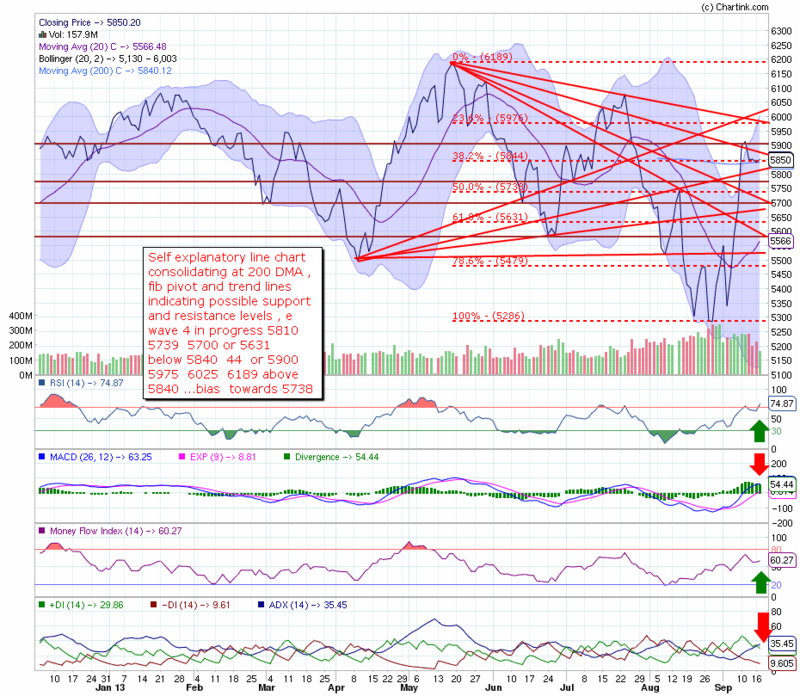 expected weekly range 5700 – 6000. 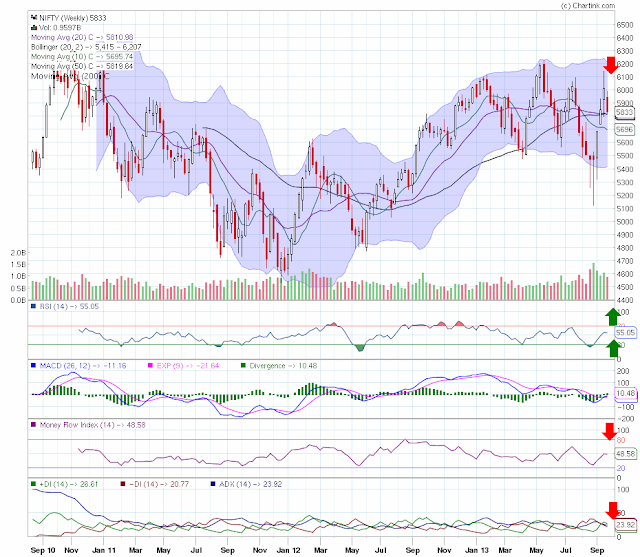 Bears may dominate only if nifty will trade below 5800 for 2 to 3 sessions . The key domestic benchmarks ended lower as the indices slumped between 2.65-3% dragged down by banking and metal stocks. Sentiment weakened after RBI chief Raghuram Rajan warned that inflation remains high, raising speculation of a further hike in interest ratdespite plummetg growth in Asia’s third biggest economy, weighing on banking stocks. A positive September month with ~7% gains has just gone by and October comes with more pessimism than optimism. Fitch’s India Ratings says unless the prices of diesel, petrol and LPG are raised, the fiscal deficit could exceed 5%. The outlook is a positive start. Indices may languish in a range with lack of positive triggers. Global cues are mixed. On the Global front, European stocks declined as Italian bonds fell after a debt auction and concern grew that budget wrangling in Washington will lead to a government shutdown. Economic confidence in the euro area increased more than economists forecast in September, adding to signs the single currency bloc’s recovery is gaining momentum. Wall Street ended lower on Friday. The S&P 500 declined 1.1 percent for the week and is roughly 2 percent below its record high set September 18 when the Federal Reserve announced it would keep its stimulus program unchanged for the present. Japan's Nikkei is marginally lower while Hong Kong's Hang Seng index is down 0.10%. South Korea's Kospi index is up 0.28%. China's Shanghai index was trading 0.24% higher at 2,161.69. In the US, the S&P 500 and Dow snapped five‐day losing streaks following positive job market data. On the Domestic front, Eyeing to increase two-way commerce by five times from the current level of $100 billion, India and the US have vowed to expeditiously address all trade and investment policy issues to remove obstacles and improve business environment in both countries. Shrinking exports and high gold imports might have pushed India’s current account deficit for the financial year’s first quarter, April-June, to about five per cent of gross domestic product (GDP) as against 3.9 per cent in April-June 2012.On the other hand, Finance Minister P Chidambaram has said the rupee’s “right value” is 59-60/dollar. A week’s before breakout above 6,000 levels has proved to be a whipsaw as Nifty lost 3% this week unable to sustain at higher levels. 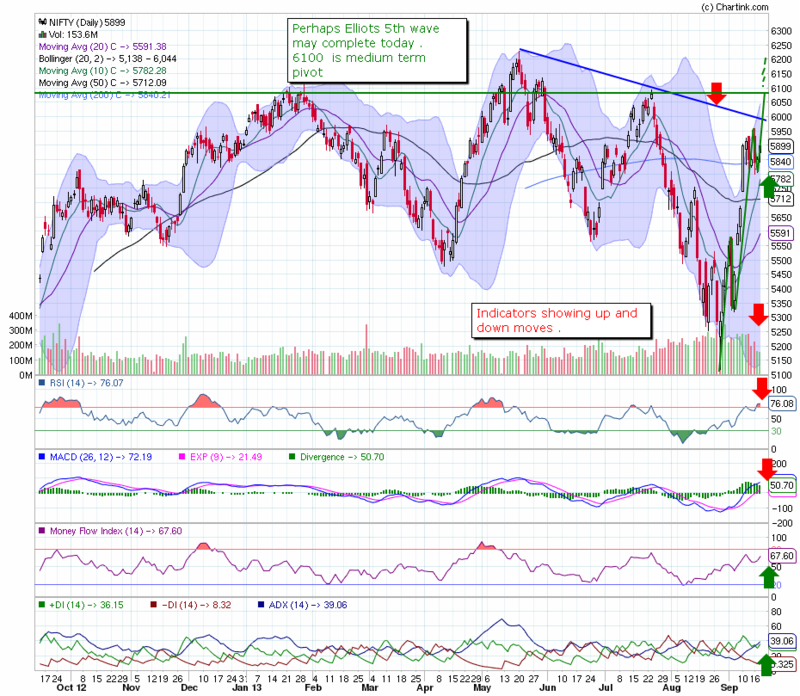 On the daily chart, Nifty is forming a bearish head & shoulders pattern with neckline placed at 5,820. 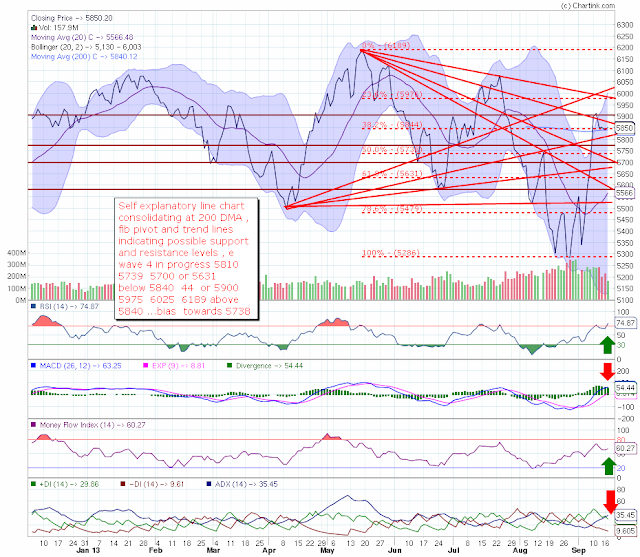 A close below the same next week would end the current rangebound phase and Nifty could decline towards 5,500 levels. 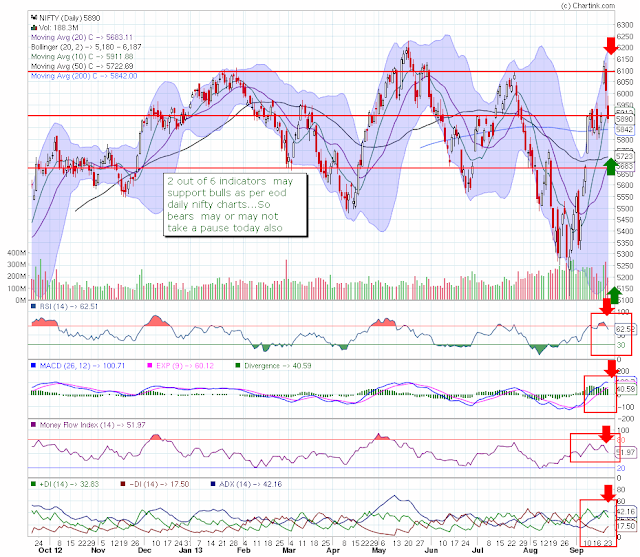 Nifty continues to be in a range between 5,800-5,970. However, momentum appears to be shifting from index heavyweights to mid-cap space. 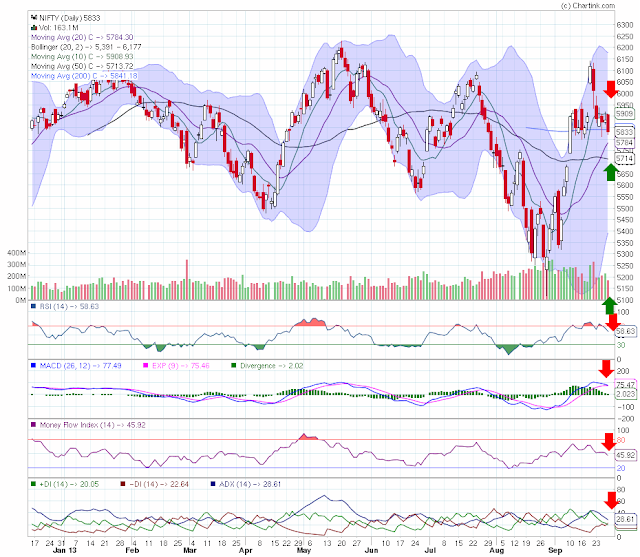 So as long the Nifty holds on to recent low of 5,810, we expect this outperformance from side counters to continue. Strong Sector rollovers in Media, IT, Telecom & Metals. Weak Sector rollovers in Realty, FMCG, Pharma & Oil & Gas. Positive Rollover cost was seen in Dish TV, Rpower, Biocon & GAIL. The ongoing Aug eight infrastructure industries data, Aug fiscal deficit data, Q2 current account balance data all would rock the market on Sept 30 followed by Sept Market Manufacturing & service PMI during 1-4 Oct.
October month has often seen crashes in the market. The coming week will see the market reacting to plethora of macro-economic numbers. On Monday, Balance of payments for Apr-Jun, 2012-13 and core sector growth for August will be announced. 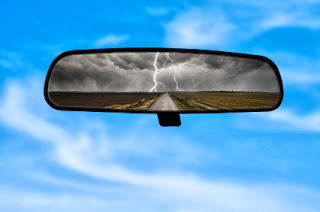 Later in the week, all eyes will be on the September manufacturing and services PMI data. Also, watch out for monthly sales numbers of auto and cement companies and of course investors will keenly watch whether or not there is a shutdown in US. Nifty entering in Oct Month on 27 Sept 13 wit flat to slightly negative opening is expected with possibility of profit booking at higher levels . Intra day view sell on rise and book profits at low . positional view start accumulation at lows for nifty short term target of 6250 6300 within a month or 2 . plan your trades accordingly. Daily nifty chart is consolidating in 5800- 5900 range ,it may stay here for few more sessions then it will break its range . 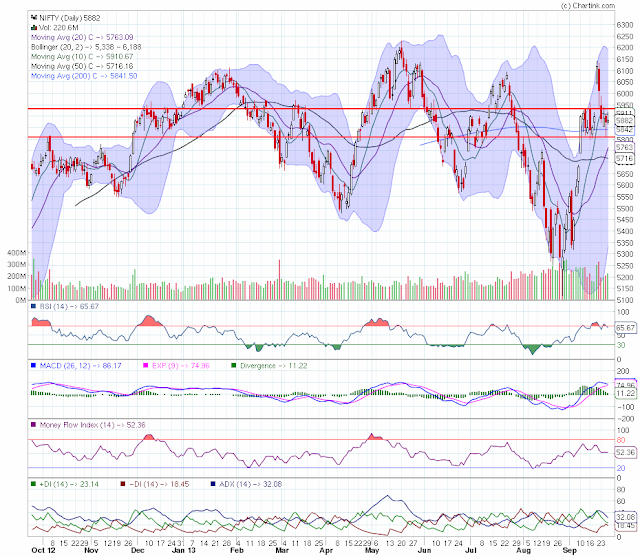 Market won’t move 200 or 300 points till it is bounded in these two red horizontal lines shown at chart . Trade in direction of wave first of all spot it and then ride on it … never try to catch the falling knife . Nifty outlook for expiry day on 26 Sept 13…Something odd is here 26 then 13 possibilities are- market may surprise all bears because maximum small traders are expecting settlement below 5750 but if market will close above 5900 after a gap down open won’t it be a surprise for all ? these are not targets these are support and resistance levels suppose NF is trading at 5940 in that case 5945 will act as roof /resistance and 5929 as floor /support if nifty will unable to move above 5940 we will plan sell nifty f at or below 5940 during market hours seeing market conditions in such cases please do not wait for 5909 to come . 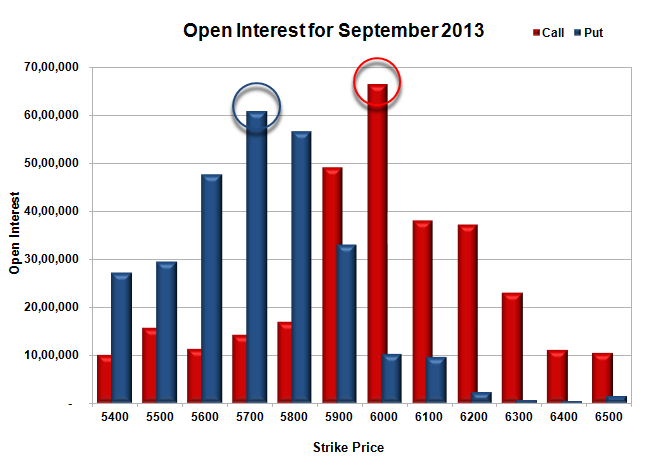 options table showing pivot at 5850. 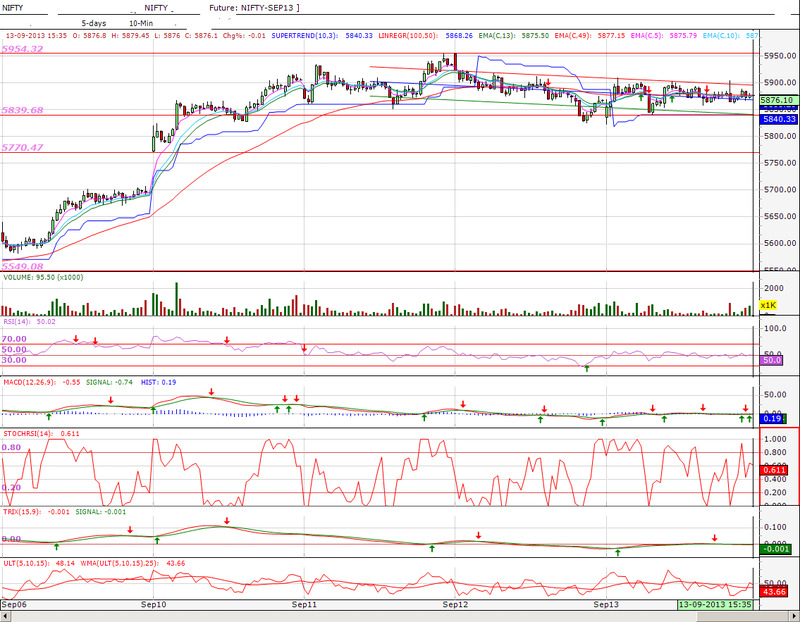 Negative to gap down opening is expected with possibility of range bound /choppy session ahead between 5860 >< 5940 . Nifty macro view as per weekly chart :- last weekly candle is ended making spinning top indicating for dilemma in traders , zone is bullish ,up or down both moves may be there as per candle but profit booking has already been started on Friday so looking down to 5850 5700 before expiry . Daily chart is indicating that 5850 5740 5560 are supports and 6100 is resistance , 5850 must hold nifty for expiry day if 5850 will break then 5740 may hold below that free fall and panic sell off cant be ruled out. Gap down opening of 1 to 1.5% is expected with bearish sentiments . 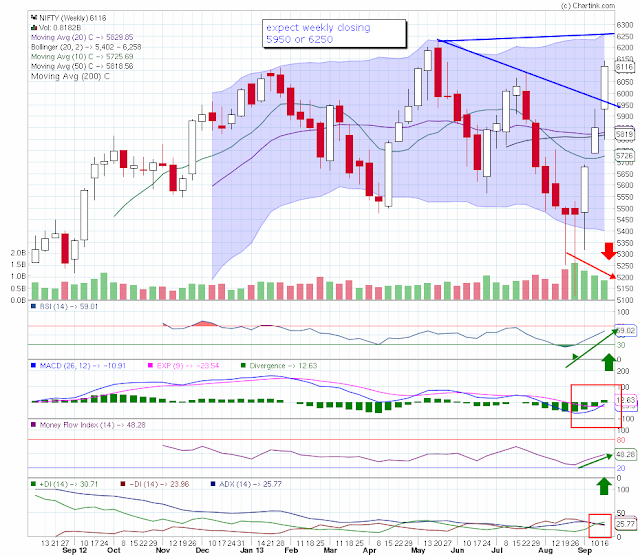 possibility of choppy session which may turned in increased volatility but red closing cant be ruled out . Trade according to trend- do not oppose it if you do not know how to swim please do not jump into the river. It was a week of extreme surprises for the stock markets. On one hand, the Fed Chairman Ben Bernanke pleasantly surprised markets and fuelled a rally across the globe by refraining from reducing its massive economic stimulus. On the other hand, market sentiment back home dampened after the new Reserve Bank of India governor, Dr. Raghuram Rajan, in an unexpected move, raised the repo rate by 25 basis points to 7.5%. The central bank also revised the Marginal Standing Facility by 75 basis points to 9.5%. Meanwhile, WPI inflation rose at the fastest pace for six months in August, driven by an 18% jump in food prices. The inflation surged to 6.1% in August against 5.79% in July. Banks are likely to show substantial MTM loss on their AFS investments in the current quarter as medium and long term bond yields are unlikely to come-off by the end of the month. Considering deepening growth slowdown, we do not envisage further repo rate hike in FY14. If the rupee continues to appreciate, then the MSF rate could be reduced further and the overall liquidity window under LAF would be expanded. With major events out of the way, the coming week will see rejigs in portfolios. Investors can do some cherry-picking in case of major fall in fundamentally sound counters. Equities fell and the rupee weakened on Friday following a surprise decision by the Reserve Bank of India (RBI) to raise the repo rate, at which banks borrow from the central bank. The rupee ended at 62.28 to a dollar against the previous close of 61.78, a weakening of 0.81 per cent. Government bond yields rose sharply. RBI would auction government bonds for a notified amount of Rs 15,000 crore on Monday, due to which sentiment in the bond market might continue to be bearish. On the global front, the focus for next week will start with the national elections in Germany, Europe's biggest economy, to be held on Sunday, 22 September 2013. Recent polls suggest neither of Germany's two main parties -- the Christian Democratic Union and the Social Democratic party -- will secure enough votes with their traditional coalition partners to cross the 46% hurdle needed to form a government, making a grand coalition between the two the most likely outcome. Also the Market Economics will release the HSBC China Flash Manufacturing PMI for September 2013 on Monday. On domestic front trend in investment flows of foreign institutional investors (FIIs) and movement in other emerging markets may determine near term trend for our markets. The market may also remain volatile next week as it would have derivative settlement. Stock specific Wipro will be in focus as the stock enters the 50-unit CNX Nifty index on Friday, 27 September 2013. Wipro will replace Reliance Infrastructure in Nifty. Markets extended the positive momentum forward after Fed Chairman refrained from reducing its massive economic stimulus. Nifty managed to close above 78.6% retracement of the entire decline since May. In the past Nifty has failed to sustain on a prolonged basis after breaking out above 6,000 levels hence more confirmation is needed with breakout above previous peak of 6,229 in order to reinforce the positive stance. 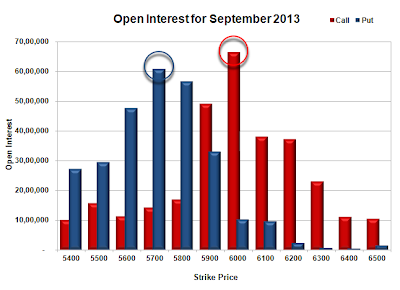 FIIs were net buyers in both Cash and Index future segment. Nifty futures rolled at around 29% and Bank Nifty at around 18%.The weighted average price for Nifty is around 5720 while that for the BankNifty is at 10720. On option front, Nifty 6100 call has seen buying since last few trading session, while put writing was visible 5900 and 5800 strike. For the week, Nifty might trade in the range of 5900-6250. Metals, Cement and Power stocks has seen long addition in last few trading session. Aug eight infrastructure industries data is expected to arrive on Sept 25 towards Sept 30. The US markets slipped on Friday, as investors reacted to the uncertain signals from US central bankers. The selloff intensified in the last few minutes of trading but despite of that benchmark indexes still managed to post a third week of gains. The final trading session of the week had one Federal Open Market Committee member signaling the Fed could curb stimulus next month and another critical of the decision not to taper in September. Federal Reserve Bank of St. Louis President James Bullard stated that the decision not to begin tapering followed weaker economic data, and that a small taper could start in October. Bullard added that tapering is more likely if the labor market continues to improve. Kansas City Fed President Esther George stated that markets were ready for reduced stimulus to begin, and the central bank’s failure to follow through on expectations hurt its credibility on Wall Street. Meanwhile, defying a White House veto threat, the Republican-led House of Representatives passed a bill that would keep the government open through mid-December and also eliminate funding for President Barack Obama’s health-care law. The bill is part of a two-pronged strategy to attack Obama’s health law. Republicans are also aiming to cripple the law in return for agreeing to raise the US debt ceiling, which Treasury Secretary Jack Lew says the debt will be hit in mid-October. House lawmakers approved the budget bill by 230 to 189, mostly on a party-line vote. House Speaker John Boehner and other Republicans insist their party has no interest in a government shutdown or defaulting on the US debt. The Dow Jones Industrial Average lost 185.46 points or 1.19 percent to 15,451.10, the S&P 500 was down 12.43 points or 0.72 percent to 1,709.91, while the Nasdaq dropped 14.66 points or 0.39 percent to 3,774.73. Indian ADRs closed in red on Friday; ICICI Bank was down 1.63%, HDFC Bank was down 1.39%, Tata Motors was down 0.92%, Infosys was down 0.63% and Dr. Reddy’s Lab was down by 0.36%. Nifty Future Index Sept month expected to close bullish above 6119-6150, as per technical's breakout resistance found at 6189, 6209. Index optimistic and bullish. 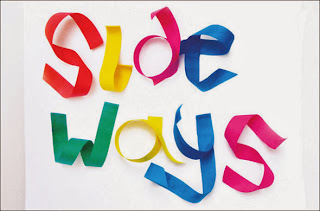 Flat to negative opening is expected with extremely volatile session ahead .advising to book profits on each 20 points nifty swing in choppy / range bound market and trail with stop loss in trending market ,to spot range bound or trending market use our own method /ideology . it is true that market trades in trend only 20 % of its trading time and 80 % trades in range . It is RBI policy day ….will Raghu surprise all of us by Chavanni ??? Chavanni will take us to 6250 and without that Chal bhag chalen South ki side.. I mean 5950 . Expecting huge gap up of 2 .5 to 3 % and then possibility of gap filling… immediate profit booking chances may or may not be there chances of increased volatility better to BOOK your LONG positions and calls at open so that you will be able to get maximum from your holdings as tomorrow will be RBI policy which may or may not come out with pleasing news. [×] [o] admin: The Reserve Bank of India’s new Governor Raghuram Rajan is expected to leave key policy rates unchanged in his first monetary policy review on Friday, and continue emergency cash tightening .. Almost flat opening is expected with possibility choppy session and profit booking at higher levels . Yesterday, the market moved up and down as market makers refrained from building large positions ahead of the outcome of the two-day meeting of the FOMC. At the end of the day, the market managed to post small gains but the news of tapering would strongly affect the market. Nifty may open at positive but fear of out come of FOMC meeting will force market participants to sell at higher level and sit on money will bring market to lower levels at later stage so advising to sell on rise and book profit at lows for intra days trades ..
Spot the trend , plan your trade according to your trading style then enter in trade with proper stoploss order and target order punched in system.. In eight sessions since Raghuram Rajan took over as the governor of the Reserve Bank of India (RBI) and came out with a series of measures to tame the weakness of the rupee, FIIs have pumped in nearly $1 billion net into Indian equities. Data suggest that this may be the start of strong foreign fund flows, a report by Deutsche Banknoted. “While it may be premature to conclude if the worst of the FII selling is over, we highlight anecdotal data which illustrates that since the global financial crisis, bouts of sharp currency depreciation in India have generally been followed by periods of strong FII inflows into equities,” the report, by Abhay Laijawala and Abhishek Saraf of Deutsche Bank, noted. Negative opening is expected with negative bias, advising to sale on rise and book profit at lows seeing eod chart views .Banking sector will be in pressure due to diminishing of rate cut hope . Trade in Nifty Futures as per these levels as per Dhanvarsha views . Inflation levels and forex market conditions are likely to be the main factors that would determine the stance of the central bank in its mid-quarterly monetary policy review later this week. “The Reserve Bank of India will take into account the behaviour of inflation as well as what is happening in the foreign exchange market and take a decision,” said C Rangarajan, chairman of the Prime Minister’s Economic Advisory Council on Monday. The RBI’s recently appointed Governor Raghuram Rajan is scheduled to announce the mid-quarter review of the monetary policy for 2013-14 on September 20, just a few days after the meeting of the US Federal Reserve’s Open Market Committee. First spot the trend then initiate trade according to it . 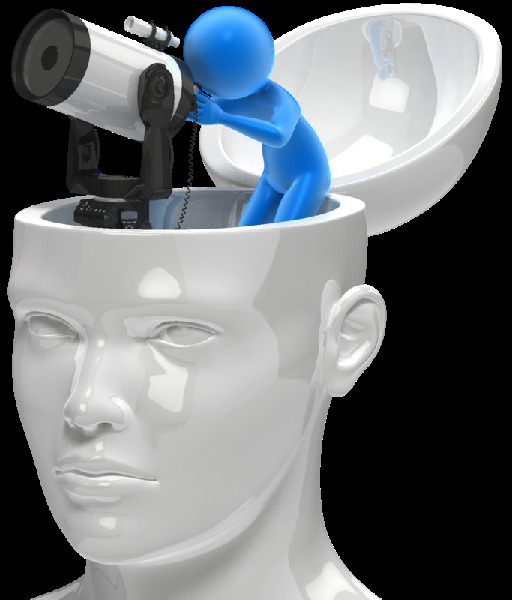 Know your self, your trader then plan your trades accordingly. scalper won’t trade as per positional trader and long term trader won’t enjoy in short term trades . Join Dhanvarsha distant learning programme today and make money on every trade . Every one is learning ..we have members between 20 to 88 Years at Dhanvarsha who are learning online. 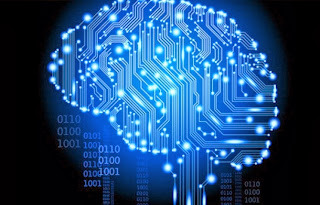 You may learn trading, chart reading and prediction in logical and scientific manner . 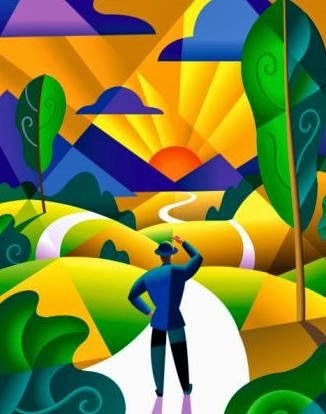 ..
Do not start your journey if you do not know the destination. Mahindra & Mahindra Ltd: M&M reported a 28 per cent slump in its domestic sales in August. India’s auto sales are forecast to remain in the negative in FY14 even as car sales rose 15.4 per cent last month, the first gain in ten months. Sun Pharma: Shares of India’s top drugmaker by market value added 6.6 per cent to their value, taking its yearly gains to 53.2 per cent. Hero MotoCorp: Shares rose 6.4 per cent in the last four trading sessions. Since July, the stock has surged 23.5 per cent as compared to a 2.1 per cent rise in BSE auto index. The company reported a 4 per cent increase in sales in August. Wipro, India’s No.3 software services firm, was the worst performer as its stock ended the week with losses of 2.8 per cent. ICICI Bank and Tata Consultancy Services (TCS) both lost nearly 2 per cent. Dr Reddy’s closed 1.5 per cent lower. 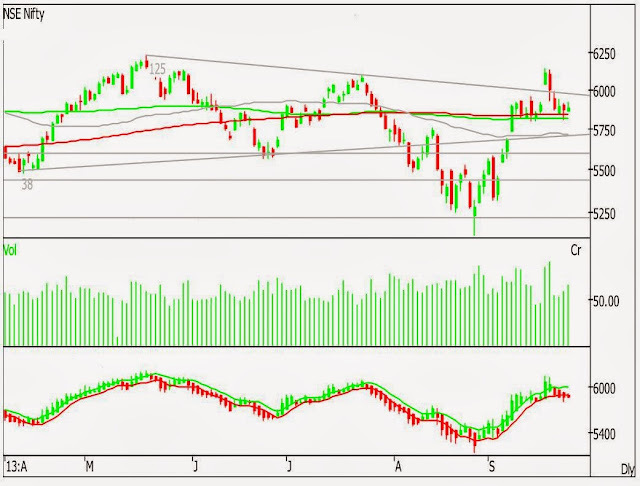 NIFTY FUTURE ANALYSIS MICRO/INTRADAY MOVES. 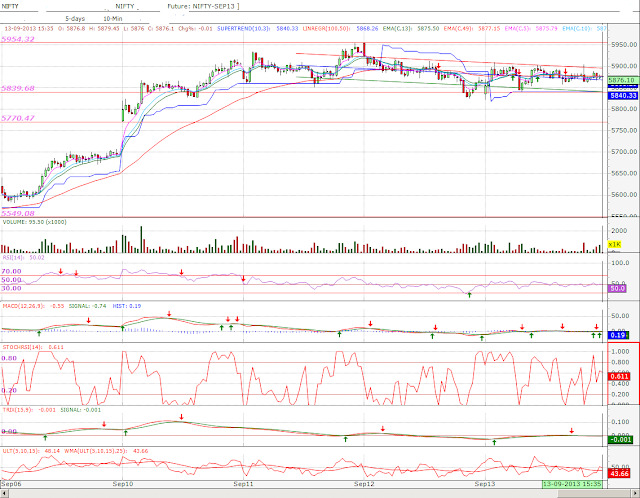 copper m buy call was planned within 11 minutes of opening – traded near predicted target .